Anyone who knows me, knows that I love music. I don't typically create playlists and on any given day the music I listen it is different; however, if you ask who my favorite band is, I have a fairly consistent response- "Elliott BROOD"! Finding them was one of those happy accidents. I was flipping through channels on XM Radio and The Verge was playing one of their songs (Write it all Down for You from Mountain Meadows). I reached into my purse and grabbed an old receipt and a pen to write down the name of the band so I could check them out when I got home. The rest is really the fun part. I rarely ventured past The Verge on the radio and I have developed a full-fledged addiction to Canadian music. The other thing that anyone who knows me knows about me is that I can't sing a lick and I don't play an instrument. So for me music is purely a "receptive art" form. I can't make it, but God knows I love it. It's like this... I know what to listen to when I need a cry, when I want to think long and hard, if I'm sad or ecstatic, worshipful or angry. Music is powerful like that; it amplifies your soul, calms your spirit, revs you up and lulls you to sleep. For me it can also be a pathway to God. 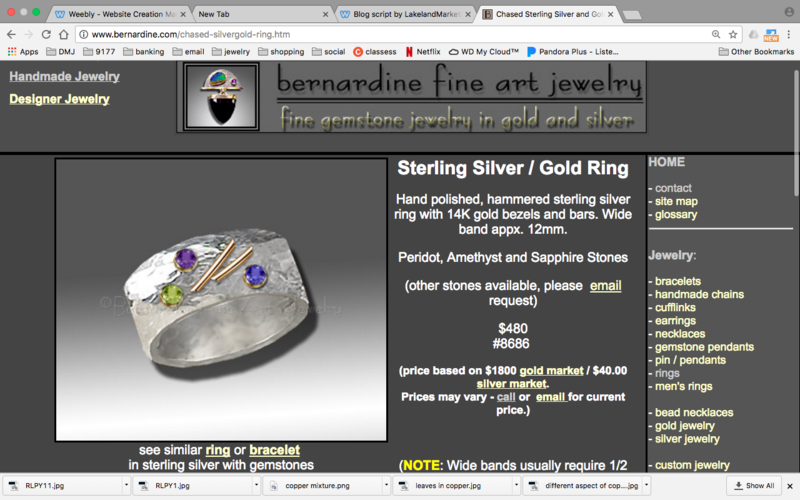 My "expressive art" form is jewelry fabrication. My best days are spent in my studio in the process of creating something or other. It is a rare day that I will work in silence because there is music! Today's time in the studio was spent in the company of Racoon Bandit, a band from Prince Edward Island that is new to me, but has gotten some significant play time in the last few weeks. The other bands for today's foray into the studio were the Phantom Band from Glasgow, Scotland and Sea Wolf from LA, CA. Totally enjoyable! And now for my title: I wish I had thought of that!. Have you ever seen something and said to yourself, "Man, I wish I had thought of that!" ? Well that is how I determine what jewelry I buy. Sometimes I see a creation and I love it so much that I have to have it. Oftentimes, if I show it to a friend, they'll tell me that I could make it myself. The fact is, maybe I could or maybe I couldn't. That's not the point. The point is that someone else had that vision. I wouldn't plagiarize a book or pretend I wrote someone else's song. Why would I steal a design? The fact is, the jewelry I buy is the jewelry I wish I had thought of. That being said, I recently stumbled across the work of an artist, Nancy Bernadine, whose work I adore. Her use of color and her exquisite designs are an inspriation to me. I do not own any of her pieces, but I hope to one day.